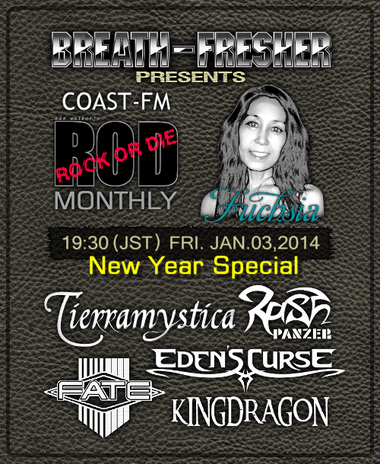 ROCK OR DIE Monthly #43 is "New Year Special", and aired at 7:30 pm (GMT+9) on Friday, January 3rd 2014. Following 5 bands will be featured on the show. After it was aired in Japan, it can be heard on podcast on our site. EDEN'S CURSE - Album "Symphony Of Sin"
FATE - Album "If Not For The Devil"
KINGDRAGON - Album "Hide The Sun"
RASH PANZER - Album "Back On The Rocks"
TIERRAMYSTICA - Album "Heirs Of The Sun"